Beautiful off water lots in one of the prestigious additions at Richland Chambers Lake. Please contact me for more information. Phyliss Jones (903) 654-0337. 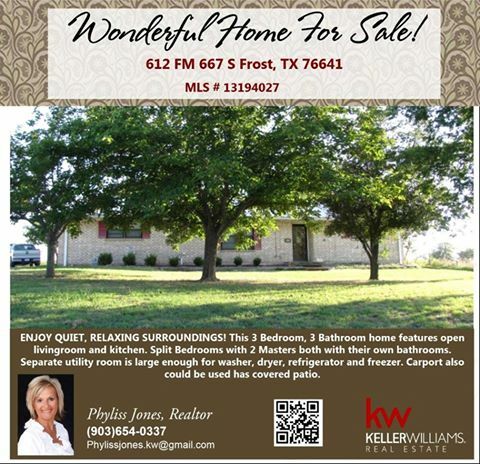 Great Off Water Lot in Corsicana! Great off water lot in Hidden Oaks Subdivision at Richland Chambers Lake. Subdivision is Deed Restricted to site built homes. lake across from Homeowners boat ramp. Located in Mildred School District. Please call me for more info. Phyliss Jones 903-654-0337. Please call me for more info. Phyliss Jones (903) 654-0337. Beautiful Home in Barry Texas! LISTEN TO THE QUITE…..This 2 bedroom, 2 bathroom custom home is tucked away from the road nestled among trees on 1.86 acres. Large family room with fireplace. Master bedroom with attached bathroom Oversized 2nd bedroom with a sitting area. Nice kitchen with corian counter tops. Large utility room with sink. New HVAC installed in 2013. New Aerobic installed in 2014. Please call me for more info. Phyliss Jones, Realtor (903) 654-0337.